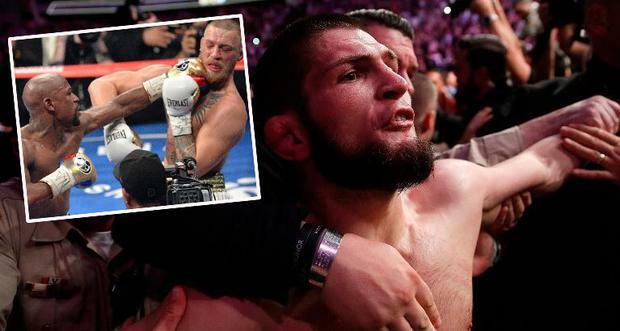 Khabib Nurmagomedov has challenged Floyd Mayweather to a showdown, telling his fellow undefeated fighter: "In the jungle there is only one king". Former multi-weight champion Mayweather was unable to knock McGregor down, which Nurmagomedov did over the course of last Saturday's bout at the T-Mobile Arena before forcing his bitter rival to tap out. And in a video posted on Instagram by Mayweather CEO Leonard Ellerbe, Nurmagomedov said: "Let's go Floyd. We have to fight now: 50-0 versus 27-0. "We are two guys who never lose. (But) in the jungle there is only one king. Of course, I am the king because he cannot drop McGregor but I drop him easily. Let's go." The Russian had his purse withheld by the Nevada State Athletic Commission, which sanctioned the event, after leaping over the cage and attacking a member of McGregor's team.